Let’s kick this blog post off with a game of spot the difference, shall we? 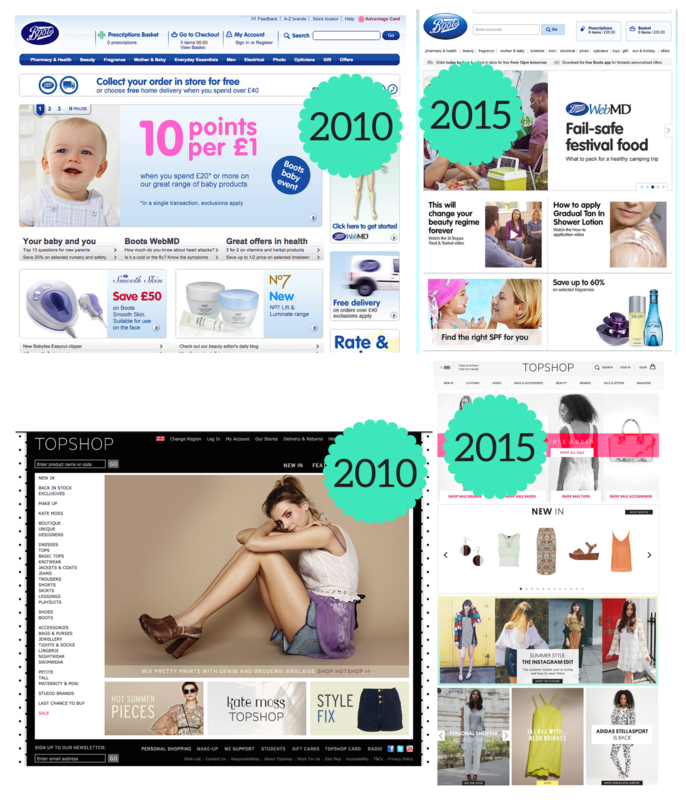 Below are snapshots of the homepages of two popular online retailers - Topshop and Boots - now and five years ago. What’s changed? Sure, design (and fashion) tastes may have changed in the last five years, but the main thing I’m getting at here is content. More specifically, the increased prominence of editorial-style content both brands feature on their homepages (and in the rest of their marketing efforts, for that matter). That online retailers are responding to consumer demand for content - from blog posts to lookbooks to interactive experiences to vlogs (the list goes on) - is undoubtedly true, and some brands are doing really exciting things in this space, using content to build their image, attract new customers, and make sure existing ones remain loyal. Before we address these areas, however, it's important to first make a couple of points about the nature of the content that you're promoting. 1) It must serve a clear purpose. Simply adding a ‘blog’ section to your site, updating it sporadically with whatever springs to mind and hoping it’ll have an effect on conversions ain’t going to cut the mustard, I’m afraid. Transactional content: aimed at convincing people to carry out a particular transaction (e.g. product videos, testimonials). Relationship-building content: aimed at attracting an audience and building loyalty (e.g. lookbooks, blog posts, vlogs, news stories etc. etc.). Nothing kills potential purchases quite like hitting a content dead-end, or forcing would-be customers to trawl through endless category pages trying to search for an item you blogged about. One way of reducing the risk of a visitor consuming a piece of content then leaving without purchasing is by lessening the friction between your content and commerce; ensuring that any product or category featured has a direct link to its corresponding ‘commerce’ page (or even better, can be added to basket straight from your content - like Topshop below, which has a ‘shop now’ box that follows the cursor, and which launches a light box when you click it). For some great examples of how online retailers achieve this, check out our post on shoppable content. So you’ve created some amazing content assets that showcase your products and link seamlessly into the purchasing process. It’s certainly a great start, but now comes the hard work - getting it in front people. The content and commerce elements of online stores are all-too-often treated as two completely separate entities: content is confined to a ‘blog’ section and has very little look-in on the standard buyer journey through a website. Here are some great ways to integrate it. Carrying on from our previous examples, the homepage presents a big opportunity for grabbing the attention of visitors and casual browsers with your content offering. Indeed, for new visitors to your site, your content can be a brilliant way of introducing your brand story and key messages across. Getting the content/commerce balance right is important - ASOS, as you can see below, dedicates around half of its homepage to news stories, guides and videos, but its product offering (in this case, its summer sale) is still the first thing anyone sees when they visit the store. ASOS often plays around with different content mediums, and its homepage really has something for everyone - from quick, bite-sized news stories to category-specific guides to video interviews. - Experimenting with your content/commerce mix and placement to see which leads to greater engagement (and ultimately, more conversions). - Considering how your target audience(s) like to consume content, and experimenting with different mediums to meet their needs. Another powerful way of encouraging visitors to read your content is to build it into the way they navigate through your site. This can be done in several ways. It may seem an obvious one, but an important first step in getting your visitors to read your content is making them aware of the fact it exists in the first place. And while it certainly shouldn’t constitute your only attempt at encouraging people to read your content, including links to it in your primary navigation is a good start (see some examples below). Interestingly, a lot of retailers - particularly those in fashion - are starting shy away from labelling their content offering a ‘blog’, instead opting to set theirs apart with for more descriptive, editorial-style titles, such as gift guides, lookbooks and magazines. Some are taking it one step further, cutting out the middleman and using their navigation bar to promote a specific piece of content rather than a section - New Look uses its navigation panel (which is present on every page of its site) to promote the store’s ‘Summer Guide’. Drop down menus are another prime piece of website real estate that you can use to house your content. Warby Parker and Marks & Spencer both do a great job of promoting content features in this way - note also how the content that is promoted changes depending on the drop down selected to make it more relevant (in these cases, this is based on gender). - Testing the click-through rates to any content sections that are promoted in your navigation bar and experimenting with how you label this content - for example, is calling it your 'blog' causing visitors to tune out? Would other names have a higher click through rate? - Promoting specific pieces of content in your website header vs generic 'blog' or 'lookbook' sections. - Including category-relevant content in each of your dropdowns. At category page level, and even more so at the product page, a visitor has demonstrated interest in a specific item, and any piece of content shown at this stage should be geared towards increasing the desirability of that item - not distracting them so they disappear off somewhere else entirely. One nice example is Reiss, who calls visitors to read its suit guide when they’re browsing the ‘suits’ category. Another great example is makeup brand Charlotte Tilbury. Many product pages on the site have accompanying video content showing tips and tricks on how to apply it, making the product more desirable without distracting from the sale. Now let’s move on to look at how online retailers can promote their content off-site as a means of tempting people in to browse and (hopefully) make a purchase. In many ways, content marketing and social media go hand in hand - social networks are well-suited to the sharing of soft-sell, editorially-focused content assets, especially ones that have strong visual elements. Below are some great examples from Twitter, Facebook, Instagram and Pinterest. A strong, eye-catching image with a ‘play’ button to show browsers that there’s video content on offer. 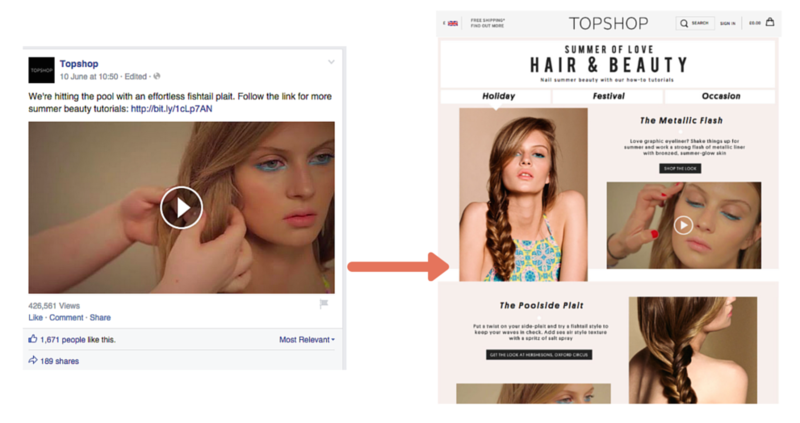 Topshop makes use of Facebook’s video posts by showcasing a hairstyling demo. While embedding your content on social networks can deter people from clicking through to your site to find out more, the brand counters this with the promise of more summer beauty tutorials by clicking a link. Instagram is, in many ways, both a dream and a nightmare for brands wanting to promote their content. Much like online retail, the network trades in beautiful, aspirational imagery, and is especially great for fashion and beauty brands. Nonetheless it’s also challenging because it does not enable users to add links to their posts - something that’s vital in driving interested leads onto a store to find out more and, ultimately, buy. This doesn’t make the network a complete write-off for content marketers, however, many of whom are coming up with ingenious work-arounds for the no-linking restriction. For example, Habitat (below) includes a tracked URL in its bio (the one place Instagram does permit a link) that takes people to the campaign page on its website. Much like Instagram, Pinterest is a fantastic platform for sharing lifestyle imagery and is wildly popular amongst fashion, health and beauty and homeware fans in particular. Unlike Instagram, it is far easier for people to share other people's content with their friends and followers, adding an extra layer of virility to posts. Crucially, you can also add external links to posts. We love the ‘style stories’ campaign by Jack Wills below, which links through to a great on-site campaign page. - Experimenting with the different post formats available on each network to see which your followers engage with the most. - Encouraging click-throughs from social media with an appropriate CTA, even if the content (for example, a video) can be consumed within the social post. - Tailoring your copy to the network you're sharing your post on. Last but not least, let’s quickly delve into how online retailers are using email to promote their content. While email remains one of the biggest channels for many online retailers, getting subscribers to keep opening and clicking on email marketing messages in the long-term is really tough. Adding your content into the mix can be a nice way of softening the hard-sell, making people more amenable to your messages turning up in their inbox. There are a number of different ways of approaching this. The first is devoting a small section of your regular product-led mailout to marketing your content - Swoon Editions does a great job of this (below). Others, like Charlotte Tilbury and Steve Madden below dedicate whole emails to showcasing their content. Crucially, however, it’s important to note that these emails still feature direct links to products too. - Testing the click through rates when you include links to editorial content and features in your broadcast emails. - Shifting the focus of your emails from pure commerce to content. The way you promote your content marketing assets will have a critical impact on how effective they are at driving customer interest and conversions. That said, be careful that you use the right content at the right time so that it doesn't distract visitors from purchasing. There are a whole host of ways that you can pimp up your social posts to make them more engaging - ensure you're optimising each and every one to maximise the chance of click-through. When posting your content to social media, make sure that there is a strong call to action to encourage people to click through to your site (even if they can fully consume the content in question on that social platform). Try including links to your content in your emails, or even dedicate whole campaigns to promoting particularly strong pieces of content.